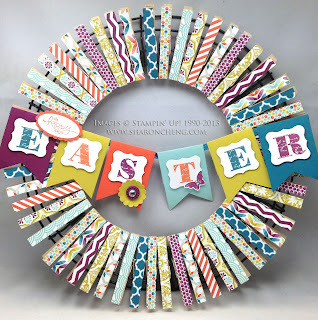 This Easter clothespin wreath can be ready for Mother's Day or Spring by changing out a few clothespins. While they take a little bit of time, these wreaths are easy to make. Once you've covered the clothespins, you can flip them over or change some of them to be ready for a different holiday. I made this wreath for Easter, Mother's Day and Spring. Notice that the colors in Stampin' Up! 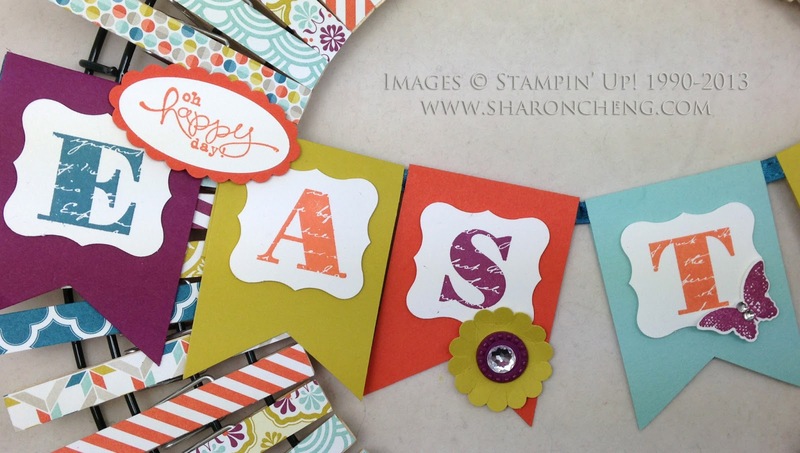 's Sycamore Street Designer Series Paper fit all three occasions. The Easter banner is attached to two clothespins. You can change them out to fit other holidays. The Christmas version of this clothespin wreath is one of my most popular posts and has been repinned many times on Pinterest. You can also see the Halloween and Valentine versions on the same post. Visit my online store to get your supplies for this project. When you purchase $25 or more in product, you are eligible for my Rewards Program.